Writer's note: This is a brand new unit for our 3 year curriculum. I intend to use in the Pentecost slot of year one. I think the other stories for winter/spring of year 1 bear repeating -- such as the calling of the disciples, prodigal son, and 23rd Psalm, and I can think of lots more fun activities to freshen these up. Pentecost was tough for our newer teachers to wrap their heads around. Plus Pentecost reinforcement can be handled through a 1-day kite making blitz. Burning bush has no link to lectionary during year 1 of our curriculum. But it's a story I want my kids to know. Hence this lesson set. The story of how God calls a man by name and sets humanity on the road to freedom. Arts (pin light suncatchers or ‘Holy Ground’ flip flops), Kitchen (‘Burning Bush Chili’), Drama (‘On Holy Ground,’ a play with actors), Computer (Exodus Adventures from Sunday Software). Exodus 3.1 - 15. READ THIS. Exodus 3:1 – 1 - 6. GOD WORKS THROUGH AN OUTSIDER. The action for the most seminal story in the Hebrew Bible, the freeing of the Israelites from slavery in Egypt, is set in motion here by an outsider. Moses, though undeniably a son of Abraham, raises his family away from the people of Israel, in the homeland of his Midianite wife Zipporah. Here God continues the precedent of acting through an outsider or foreigner, therefore reinforcing the idea that faith is built on God’s love for all. WHERE EXACTLY DOES THIS EPISODE TAKE PLACE? This map, though small, gives alternate routes for the Exodus, including a northern one. The possible location for Mt. Horeb/Sinai described in footnotes cited above would lie along the northern route. This translation has active rather than passive connotations, and introduces a God who is without fail very active in human life and affairs, by no account a remote or disinterested God. WHAT IF THE BIBLE BEGAN WITH THE BURNING BUSH? “In many respects, the account in the Bible might have been simpler if it had begun where the story of Israel in effect begins, with God appearing in a burning bush to Moses. Moses in Egypt, having escaped from the original massacre of the Hebrews and having been brought up as an Egyptian, looks over the landscape and sees a bush burning, yet without burning up. The emphasis is on the ear rather than the eye: the fact that the bush burns is merely there to attract Moses’ attention; but it is the voice that speaks from within that is important…. “Now if you begin the story there, you have immediately wiped out the whole dreary chess game that is traditionally known as theodicy. That is, how are you going to reconcile the existence of a perfectly good God with a horribly bad world, and yet without involving the good God in the bad world in any causal way?... Here, there is a situation of tyranny and exploitation going on to start with: the first datum is injustice, tyranny and exploitation. God then announces that he is giving himself a name and a highly partisan role, and is going to enter history in the side of the oppressed classes. Never mind how you got into the situation: how you get out of it is the important thing…. “And it is a matter of highest importance for our understanding of our own cultural traditions that the tradition we have derived through Judaism and Christianity from the Bible has this revolutionary factor which the Exodus story gives to it. All the characteristics of the revolutionary mind are adumbrated right there, and you find most of them repeated in Marxism today…. There’s some terrific art out there depicting the burning bush. There’s an equally wonderful Ratner painting on this page. Here’s a painting by William Blake. Here’s Marc Chagall. Scroll down to the fourth image on this page. For many more burning bush images, start at this page on Biblical Art on the www. 1. What is Moses doing when he sees the burning bush? 3. What is unusual about this bush on fire? 4. Where does God tell Moses he is standing? 5. What name does God give as God’s own name? 6. What does this name mean? 7. Does Moses jump in with both feet and accept God’s assignment, no questions asked? 8. Have you ever had a burning bush moment in your life, when God called you to take on a certain challenge? 9. What form did your burning bush take for you? 11. If you accepted God’s challenge, did you end up going on that journey alone? With other people? How did these other people help you achieve your goal? 12. 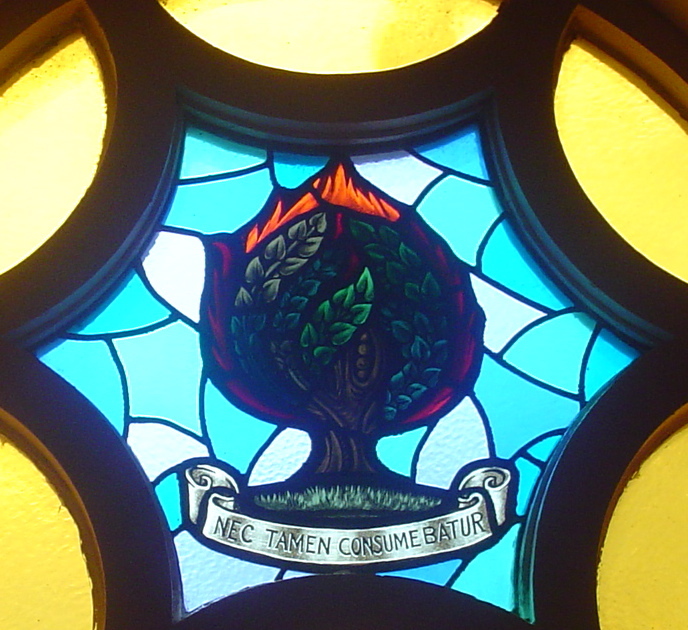 Is there an image of the burning bush somewhere around your church [stained glass window, altar cloth, church denominational emblem]. 13. Can you name ways that your church family has responded to a challenge God has put before it on holy ground? ACTIVITY: MAKE PIN LIGHT SUNCATCHERS. THESE WILL ILLUSTRATE GOD CALLING THE CHILD’S NAME FROM A PLACE OF ILLUMINATION. Have the children cut a burning bush shape out of the coloured paper. (Make sure they leave a fairly large centre section for their names). They will write their names to fill the centre section. Then with a pushpin, outline the letters in pinholes. Punch a hole in the top and thread with yard to hang. The sunlight shining through the pinholes will illuminate their names giving the effect of God calling their names. ACTIVITY: MAKE SPECIALLY DECORATED, NON-STREET SHOES SUITABLE FOR WEARING ON HOLY GROUND. WILL HELP THE CHILDREN ESTABLISH, RECOGNIZE AND APPRECIATE THE KIND OF RESPECT THAT COMES WITH SHARING HOLY GROUND. • enough pairs of dollar store flip flops for all children in your class. Well, in the real story, Moses was told to take his sandals off to show respect. But what our children understand from everyday life is that if they are a guest in someone’s home, they take off their street shoes. Sometimes here in Canada in winter boot season, we plan to leave wet, sloppy snowy shoes at the door, and put on indoor shoes or slippers we have brought with us. So in this lesson we are creating something that brings on the mood of respect that goes with holy ground. To make the slippers: Glue fancy findings to the top straps and perhaps the side soles of the shoes. ACTIVITY: Make ‘Burning Bush Chili.’ Create holy ground by making an event of it, and inviting the congregation to come for lunch and be reminded of how God calls us by name. • ground beef, onions, chopped mushrooms, 2 cans kidney beans, 2 cans tomato soup, chili powder. (My son insists on adding chopped leftover sausage as well to his chili.) Bring some butter and a bag of nice soft dinner rolls for your fiery fete. ACTIVITY: ACT OUT PLAY FOR THE BURNING BUSH STORY. Click here for a script for younger and older children. ACTIVITY: HEIGHTEN THE CHILDREN’S FAMILARITY WITH STORY OF THE BURNING BUSH THROUGH THE COMPUTER PROGRAM, ‘EXODUS ADVENTURES,’ FROM SUNDAY SOFTWARE. On Holy Ground, Burning Bush Rotation © November 2006, LD McKenzie. Dedicated to the memory of Blaine McKenzie.